Abba Sensation, London's premier Abba Tribute act combine high quality musicianship, perfect harmonies, authentic replica costumes and spectacular costume changes. Combined with exciting choreography, sizzling performances and a sprinkling of lighthearted humour, Sensation produce a dynamic jaw-dropping show with universal appeal. The band even speak Swedish on stage! Abba Sensation work incredibly hard to deliver an Abba experience second to none. This dedication has seen them perform all over Europe and the UK. 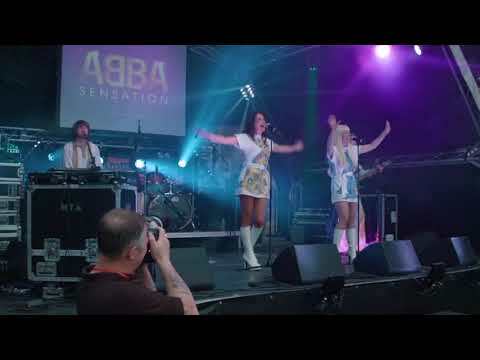 Once you've experienced Abba Sensation you'll understand why this band can lay claim to being possibly the best Abba tribute London has to offer. Get an instant quote and date check online now! This is a band that books out very quickly so don't be slow. Sorry, Abba Sensation doesn't have any photos right now Send us an enquiry and we'll get back to you, or check out the rest of the act profile. 1.All The ABBA hits you can think of! ABBA sensation were amazing for my wife’s 50th birthday party. Nothing was too much trouble for them. They were totally professional in every manner. Thank you so much. "On behalf of all the staff at IKEA, I would like to say a big 'thank you' for helping to make the store's 15th birthday a success. We had really positive feedback from everyone that experienced the band's performances and we will definitely be inviting you back again to play a part in our future in-store celebrations." "Many ABBA tribute bands have tried, many have failed, these guys and gals are definitely at the top of the pile. Its really refreshing to be able to work with a band who are all so easy going and professional in their attitude. Should be called Sensational, you were fantastic!" "Sensation were fantastic! You were perfect for our event and helped everyone to let their hair down and have a great night. Thanks once again and we'd love to have you back in the future!" "I just wanted to say a massive thank you for the Leeds launch last week. Everyone commented on how great you sounded, how professional you were and what a great job you did!" "I booked Sensation for the Royal Wedding night at our Sports Club and although sadly Will and Kate failed to show up the band more than made up for it. From a organising point of view they were really easy to book and there was plenty of contact prior to the event to confirm details. The band turned up early to set up and were four really genuine and nice people. The show itself was brilliant and I fell in love (all over again) with Frida! Super professional and everyone loved it - would highly recommend Sensation to anyone - thanks!" "It was the first time I saw Sensation live on stage and it was amazing! Great show, we loved it! Thanks also for making the great Unity FM jingle"
"You were awesome, thank you so much for bringing the night to an end in such spectacular fashion. That was the loudest we'd heard the crowd sing all night!" "Wow wow wow is all that we can say. You guys helped make our day even more special than we could ever have imagined. We were so impressed with your determination to get to our wedding - we so appreciate it. The evenings performance was amazing and our guests loved the evening so much you were the main topic of conversation at breakfast this morning. Next year is my 40th and I'm sure we'll be asking for your services again. Thank you is not enough for what you did for us yesterday."